Interviewed for this case is Erik Lindroth, former Marketing Director at Tetra Recart, on Tetra Pak’s systematic approach to managing opportunities and developing their understanding of customers. The Opportunity Toll Gate process and the Attribute Mapping framework are presented as concrete tools to develop Unique Selling Points that differentiate Tetra Pak’s products from those of the competition. 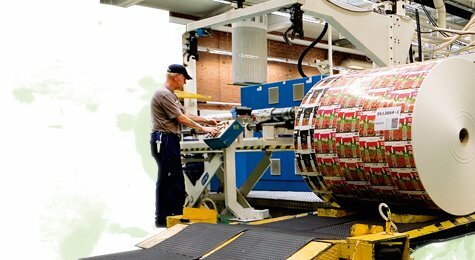 Tetra Pak supplies complete integrated processing, packaging and distribution lines and standalone equipment for the food industry. Tetra Pak is operating in more than 150 markets with over 20,000 employees. Founded in 1951 by Dr. Ruben Rausing, Tetra Pak’s unique innovations have changed the way food is packaged and distributed around the world. This case focuses on Tetra Recart, “the 21st century alternative for canned food”, which is one of the latest additions to the Tetra Pak product portfolio. The Tetra Recart package is specially designed for products that have traditionally been packed in cans, glass jars and pouches. The Swedish Tetra Pak has developed what they call the “Opportunity Toll Gate approach” for managing the company’s sales funnel. At Tetra Pak Recart it is being used for developing a good understanding of the customer needs so that the best solution can be built for each customer. “Our model is all about identifying and managing business opportunities, which is why Tetra Pak has named it the “˜Opportunity Management Process’”, says Erik Lindroth who used to lead the marketing team at Tetra Recart. “We feel that both our customers and we ourselves have benefited from the very systematic way of doing customer intelligence within the framework of the Toll Gate process”, Lindroth continues. The Opportunity Management Process consists of steps that have been described in the table below. More than anything, the Opportunity Management Process for Tetra Recart is a method for ensuring quality at each step of the process. The first step ensures that the focus is on the right customer categories and that Tetra Pak understands the general needs of these customer categories ““ along with the needs of each individual company that they contact. At the second step, a business case is developed based on the needs analysis that was conducted. Payback calculations are included in order to both highlight the investment nature of the solution and to describe the implementation process. Step 3 includes developing the proposed solution and preparing the final quote. In this phase, the needs of the customer must be thoroughly understood. A finalized pay-back calculation will be presented as well as a risk response plan. At this stage, Tetra Pak must of course understand the customer’s existing solution and price per produced volume. Tetra Pak has a good understanding of different competing solutions but needs to also know the precise cost per can or bottle in order to understand the financial impact on the customer and how valuable they will perceive the eventual Tetra Recart solution. Tetra Pak conducts “Attribute Mapping Analysis”, illustrated in the graph below, in order to identify product development needs as well as Unique Selling Points. The USPs are used in order to be able to discuss and convince customers to switch from cans, bottles or whatever they are using for their food products today to Tetra Recart. A product attribute is a feature of the product that may be perceived in a positive or negative way by the clients. The product attributes also differentiate the Tetra Recart solution from competing solutions in metal or glass. In a sales situation, the Attribute Mapping Analysis will depend on the role of the person on the customer’s side: The attributes will vary based on whether Tetra Pak’s sales people meet a plant manager or a marketing or sales executive. From the strategic perspective, the analysis is of more generic nature. The idea is to identify the “strategic sweet spot”, i.e. the attributes that are perceived as important by the customers, but where Tetra Recart comes from a position of relative strength. The customer knowledge is developed by meeting the potential customer and discussing the needs with them. “Historical knowledge of similar companies in the same industry also helps, but that will only take you so far”, Erik Lindroth comments. “Understanding each customer’s unique visions, ideas and needs is vital, and we need face time to achieve that”, he continues. Typical examples of attributes that Tetra Pak uses are “capital investment needed”, “easy to open”, “supply chain efficiency”, “shelf size efficiency”, “environmental image”, and “appropriate for marketing and information purposes”. Within the Attribute Mapping context, the understanding of competition is developed through conducting benchmarking analysis, consumer research, customer satisfaction surveys and even direct shop visits to learn how the final product is displayed in supermarkets and local shops. “I usually have quite a number of photos in my camera showing competing products displayed in stores around the world when I come home from business trips or vacation”, Lindroth smiles. The attributes on the right hand side of the matrix in the graph presented are the Unique Selling Points that will be used in the general marketing communication as well as in the sales discussions with potential customers. Other attributes may be the basis for product development actions. 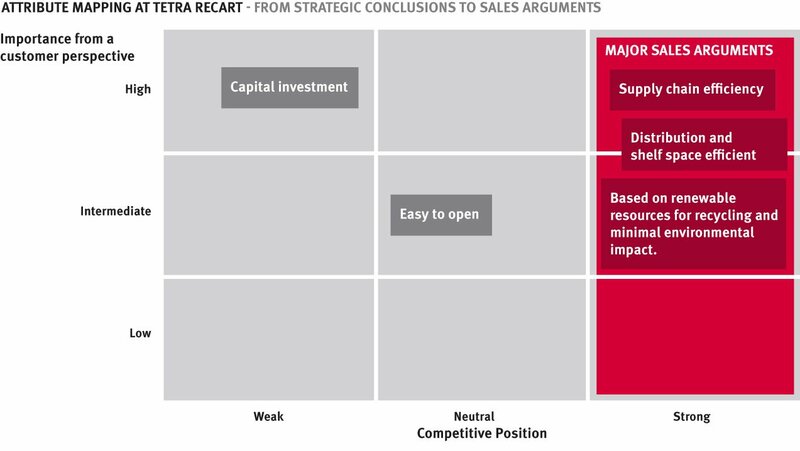 Based on the above analysis, Tetra Recart has identified the Unique Selling Points that they want to communicate to the customer and to the end user. These are benefits to the customers that other containers like glass, plastic or aluminium cannot provide to the same extent. “Competing solutions such as the aluminium or steel can as well as glass containers do not have all these attributes”, Erik Lindroth points out. “Since the green environmental trend is in vogue at the moment, Tetra Recart is trying to ensure that customers can capitalize on the minimal environmental impact that the product has compared to other solutions”, Lindroth explains. Frequently, Tetra Pak’s customers who may not have an intelligence program in place by themselves, become impressed by the understanding that Tetra Pak has developed about its customer segments. “Showing customers that we are interested has often carried us a long way”, Lindroth says. “Through systematic customer intelligence, we have managed to improve our relationships with existing customers, but we also have an improved understanding of risks related to different types of customers”, Lindroth sums up Tetra Pak’s experiences.